RVA Beer Week is finally upon us for 2013. Running from November 1st to 10th, there will be a lot to experience. If you’re looking to eat your way through the week, here are some options. Go over to Saison and try one of their special beer cocktails with some of their amazing food. Additionally, all Richmond beers will at a special low price all day long! 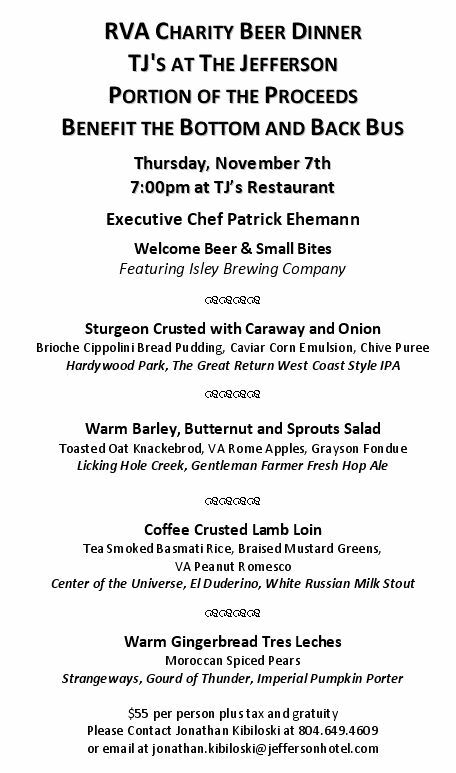 Popkin is inviting people to come anytime of the night and try their special Hardywood Beer Dinner Menu. Even still reservations are strongly recommended. There could be special tappings of their cellared kegs such as Bourbon Sidamo, Bourbon Cru, and Brian’s Blend #1 if interest in the dinner is large enough. Head over to the Facebook event for more information. The beer dinners at TJs have always been top notch. This promises to be the same. $5 from every plate goes to 2 Bottom & Back Bus.